A family is a group of two people or more related by marriage, blood relation, or adoption and who live together. 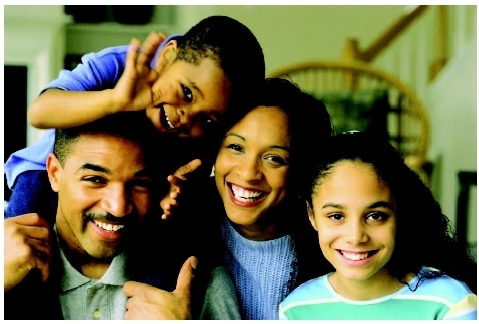 The immediate family traditionally consists of parents and their offspring. No other factor influences children as deeply as their families. As a social unit with genetic, emotional, and legal dimensions, the family can foster the child's growth, development, health, and well-being. The family can provide the child with affection, a sense of belonging, and validation. Every area of a child's life is affected by the family. The family has basic functions. In order for the family to meet a child's psychological needs, its members must be nurturing, convey mutual respect, provide for intimacy, and engage in bonding and attachment. The family also socializes the child, guiding the child to be members of the society beyond the family. The family conveys religious and cultural beliefs and traditions to the next generation. The family is the child's source of economic resources, which meet the child's various physical needs for food, shelter, and clothing. Then, too, the family sees to it that the child receives health and dental care. Family structure is dynamic. In 1970, traditional nuclear families made up 40 percent of all households, but only 26 percent of all households in 1991. In addition, roles have changed within the nuclear family. The role of provider, once assigned mainly to the father, gradually came in the early 2000s to be shared by both parents, and as of 2004 many fathers are more active in parenting their children than their fathers were in parenting them. Toward the end of the twentieth century, increasing numbers of families did not fit the nuclear profile. Some families have only one parent; others are combinations based on second marriages; still others are comprised of unmarried couples living with or without children. The number of single-parent families increased from 12.9 percent of all families in 1970 to 29 percent in 1991 and 28 percent (20 million) in 1997. The increases are mostly the result of the increase in the divorce rate and the increase in births to single mothers. Many women are single parents and heads of households, and many of these live in poverty. Poverty is the single most powerful risk for families and children and affects families in many ways. Poverty exerts its greatest impact during children's preschool years, the age group in which children are most likely to live in poverty. Poor families are less likely or able to provide educational and cultural experiences for their children. Parents' economic status (education, occupation, and income) controls the parent's ability provide adequate housing, a safe environment, and responsible child care while the parents work. Availability of and quality of social support influence family life and well-being as individuals cope with raising children in poverty. Unemployment by either or both parents causes financial hardships and social and emotional strain, which can disrupt family life. The quality of the parent's work and the satisfaction the parent gets from it affects the parents and, in turn, their effectiveness in parenting. Child abuse and neglect is a destructive force in families and results in children's anxiety , depression, lowered self-esteem , and a decline in school performance. Similarly, children who witness domestic violence suffer some of these same consequences. Parents are troubled by children who are out of control and have problem behaviors such as running away , truancy , school failings or suspensions, and delinquency. Youths who are habitually truant may need school counseling. Truancy specialists provide topic-focused workshops and referrals to family counseling; court intervention is sometimes necessary. The frequency of divorce and remarriage produces stepfamilies with their own difficulties and challenges. The new stepfamily members may have no shared family history or common lifestyle, and members may have different beliefs. In addition, children may feel torn between the custodial parent, with whom they live, and the noncustodial parent, with whom they visit. Culture —The system of communal beliefs, values behaviors, customs, and materials that members of a society use to understand their world and each other, and which are passed down among suceeding generation. Custodial parent —A parent who has legal custody of their child or children. Extended family —Traditionally defined as the biological relatives of a nuclear family (the parents, sisters, and brothers of both members of a married couple); sometimes used to refer to the people living in the household as partners and parents with children. Noncustodial parent —The parent who does not have legal custody of the child and does not live in the same home with the child. The noncustodial parent has financial responsibility for the child and visitation rights. Stress —A physical and psychological response that results from being exposed to a demand or pressure. A traditional family of father, mother, daughter, and son. in children. Family economic stress may cause parental substance abuse, which can lead to school distraction and declining academic performance in young people. Finally, children may feel isolated from parents and friends. The most stressful time for a family can be the period preceding a possible foreclosure or business failure. Parents may make desperate attempts to save their source of income. They may also be trying to keep their loss hidden from the rest of the community. Such behaviors can isolate children from parents who are too busy to notice and from neighbors who are not even aware of their trouble. The long-term effects of continued family stress can cause physical and psychological problems for children. If problems occur often and if several problems appear at the same time, serious attention should be given the child. Parents should call their pediatrician if the child shows unhealthy physical or emotional symptoms that may be in response to family problems or transitions. Physical problems may include weight gain or weight loss, or unexplained stomachaches or headaches. Emotional problems may cause a decline in academic performance, breaking curfews, or getting into trouble in school or with the law. Bernstein, Bob. Families of Value: Intimate Profiles of Pioneering Lesbian and Gay Parents. New York: Avalon Publishing Group, 2005. Cunningham-Burley, Sarah, et al. Families, Relationships, and Boundaries. Livingston, NJ: Policy Press, 2005. Evans, Tony. Divorce and Remarriage. Chicago, IL: Moody Press, 2003. Everett, Craig A. The Consequences of Divorce: Economic and Custodial Impact on Children and Adults. Binghamton, NY: Haworth Press, 2003. Forbes, L. S. A Natural History of Families. Princeton, NJ: Princeton University Press, 2005. Hansen, Karen V. Not-so-Nuclear Families: Class, Gender, and Networks of Care. Piscataway, NJ: Rutgers University Press, 2005. Jeynes, William. Divorce, Family Structure, and the Academic Success of Children. Binghamton, NY: Haworth Press, 2002. McKenry, Patrick C., et al. Families and Change: Coping with Stressful Events and Transitions. Thousand Oaks, CA: Sage Publications, 2005. American Academy of Child and Adolescent Psychiatry. 3615 Wisconsin Ave., NW, Washington, DC 20016–3007. Web site: http://www.aacap.org/.